For me, it was the experience of paying $140 a night for a roach-infested room with a dirty shared bathroom that really drove home the point about the importance of jumping on good New York City hotel deals when they do come up. In that spirit, I wanted to pass along these fall, early winter, and holiday hotel discounts at New York City hotels. May your holidays be affordable and as roach-free as possible. GEM Hotels in SoHo, Chelsea, and Midtown West have a Cool Yule rate of $139 per room (regular nightly rates for the period are around $219) for stays between November 20 and 29, and December 13 and 29. At the Broadway Hotel & Hostel, guests staying three nights or more during November receive 10 percent off the whole stay. Private rooms start at $159 per night, while a spot in a dormitory-style hostel room start at $26 per person, per night. Between November 1 and December 29, guests staying three midweek nights at the Marrakech Hotel will get 15 percent off the best available rate with promo code HOL. At Starwood properties through the end of the year, for every night you pay the regular rate, you’ll get 50 percent off the next night with promo code ZBT. At most participating New York City properties, including W New York, Sheraton, and Four Points by Sheraton, the offer is good for arrivals Thursday through Saturday. Dozens more hotels are offering 20 percent off the best available room rate on Sunday stays through December 27. And around the state, events will be continuing throughout fall and into winter to commemorate New York’s 400th anniversary. Events, exhibitions, and activities to celebrate. 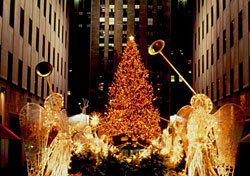 Are you heading to New York City for a fall getaway, seasonal shopping, or to celebrate the holidays? Share your savings tips with other readers below!